Since moving to the UK seven years ago, my mother and I have made a little tradition that when she visits we take a few days, just the two of us and go exploring. It gives us time to spend quality time together and enjoy each other’s company along the way. We both love to sightsee, see other cultures, churches, castles, and beautiful historical places so it’s a win-win. I won’t share with you all of them, that will take a few posts, but one in particular I am recalling today, from our trip to Florence. A day in Florence we had together that I will long cherish and remember forever. I was almost eight months pregnant with Buba. Shh, don’t tell the airlines, I lied to get on that plane. Who me almost due, never, I just like to eat! lol What could they say to that? But I wanted to take one last trip before becoming a mother myself. 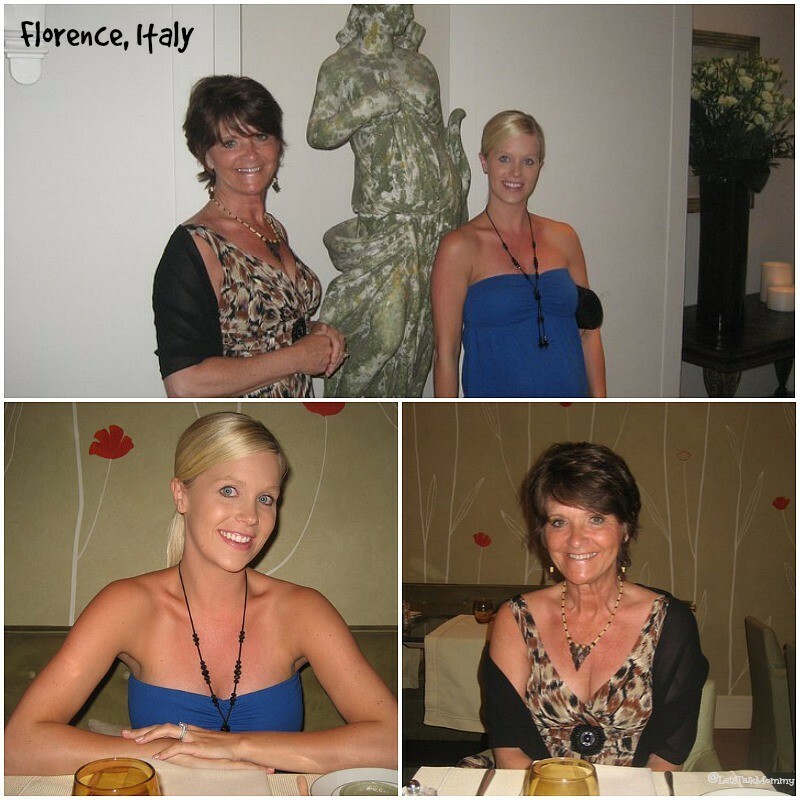 I had been to Florence before but not since I was 16 years old on a school trip and my mother had never been. I was working for the Rocco Forte Collection Hotels so we were ever so lucky to stay at Hotel Savoy right next to the Cathedral. The place was stunning and so was the square that laid out in front of it’s doors. From grand marble bath tubs to Italian shutter terraces it was heaven! I remember it was the third day of our sightseeing tour, this time a lot of walking was involved. We had a good routine set by this time, walking up the street to a little cafe around the corner where we knew they had good breakfast with good coffee for a reasonable price and could speak a little english. We enjoyed our morning, not in any hurry to be anywhere but had a tentative list of places we wanted to see. It was hot that day. I attempted the shortest, lightest dress without offending people. Hot weather, pregnant and walking really don’t mix. But I didn’t care I was in Florence, ITALY! We must have walked miles and miles that day. From one side of the city to the next, which isn’t hard to do when you are surround by such beauty. The sun was beating down on us, something fierce. I kept getting those looks of “should you be at home with your feet up”. I will tell you now the Italians do not think pregnant woman should do anything, especially late in pregnancy. I had to fight off the doorman at our hotel to let me carry my own handbag to my room, for goodness sakes. By day three though I was accustom to the pointing, staring and even the side comments while I walked, no make that waddled, waddled, and waddled around. That morning we saw churches, and bridges with so much history to be told. We took thousands of pictures of everything we could spot, to capture it all. We had lunch, nowhere special but ended up in a gorgeous little garden area. It was peaceful and sweet to sit and nibble our sandwiches surround by such beauty. Florence really has some spectacular views. After lunch, we came upon the biggest market I have ever seen. There were stalls for miles every which way. As a scarf fanatic, I came across a scarf stall, of course. But it wasn’t an ordinary scarf stall, there stood behind the temporary wood counter, really I think it was an old door converted, stood a tiny bald man. He was the best salesman I have ever known. 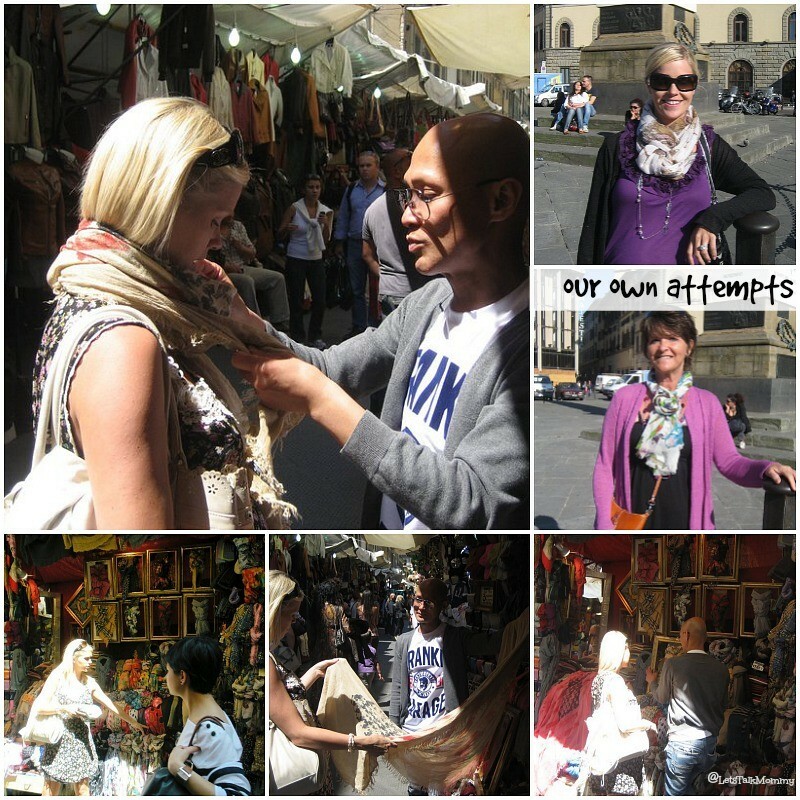 He not only had my arms full of new scarves by the end of it, he sat there forever and taught my mother and I all different ways to tie them. His stall was full of various fancy braids, swoops, and swirls. Things I wish I could really recall today, but they were amazing. If you peak below, bottom left hand corner, you can see some of his creations in gold frames! We couldn’t stop laughing at how long he spent with us and teaching us how to wear our new fashion accessories. To the right, you can see we attempt some a few days later, what do you think? My momma’s scarf was made into a rose, and I wish I could remember how to do it now. It was a full day, of sightseeing, enjoying sun and most importantly laughing and hanging out with my momma, who I am ever so close to. We ended this perfect day, with a perfect evening by getting dressed up and treating ourselves to one fancy meal in the hotel we were at. Mother looked stunning, if my Dad could have saw her then, I know there would have been some wolf whistling. Don’t worry Dad, the Italians had that covered for you. I attempted, my best dressed, at almost 8 months pregnant, I didn’t have much to work with. But I remember sitting there at the dinner table, looking at my mother, rubbing my swollen belly, thinking I hope I have this much fun and have this tight of a bond with my baby as my mother does with her baby. What a perfect day that was indeed! Can you recall a perfect day, come join in with The Prompt Week 13, at MumTurnedMom. Ahhh I hope she can visit you someday soon. I was sad we didn’t get to do the mother daughter trip this year because flights are so expensive right now. Boo Big hugs. Do a facetime coffee meeting. We just schedule a time where its just me and just her both have a cuppa and facetime together. It is great too. Nice to show her where you live tho I am the same. Yeah the fare nowadays is brutal. This easter we schedules one massive skype chat! Cant wait! We do that. That’s great it always helps to get to see them even if it’s through the computer. Enjoy your easter hunny. Hhaha You can always take your future daughter in law!!! 😉 Oh I think Florence would be great with kids. Where we were anyways, tons of carnivals in various squares and so many things for families to do. The Hotel Savoy is amazing for families too! I will be taking my two in the next few years. I love it there. Go to Pisa for the day. So much fun. Ahh it looks like you had so much fun but i can’t believe you did it all at 8 months pregnant – go you! Ahhhh thank you SOOOO MUCH Michelle. That is the best thing I have heard all week. You just made my weekend. Big hugs to you and your support. Looks like you had a lovely day hun! Thank you we really did. That looks like so much fun! You are a brave woman getting on the plane 8 months pregnant too. My mom is coming from the Sates to visit next month and I am so excited – I’m afraid she’s not getting anywhere as exciting as Florence but she’s looking forward to seeing some of West Yorkshire this time at least. Last time I was 9 months pregnant and we didn’t make it very far! We are and I am so grateful for it. I only wish she lived down the road not 10,000 miles away. But we do make the most of it. I use to be the same too when I lived only 10 hours drive away. Only saw her here and there but now that I live 26 hour flight we really have to make the most of it. Has helped me cherish her and our time together. Not that I didn’t before if you know what I mean. It was a great day together! What a gorgeous post. I am sure the bond between you and your babies will be just as strong as it sounds as though your mum has invested a lot of time in nurturing your own relationship. It is such a fantastic city. I was there the second time 8 days and I still could go back and seek new things to see and adventures to go on there. It’s lovely. We went to Florence for part of our honeymoon. It is a beautiful place and would be perfect for mum and daughter to explore. Brave to go at 8m pregnant. I did Edinburgh and walked miles there, but not in heat!